England have called up Jon Lewis to their squad for the next two one-day internationals against India following an injury scare to Andrew Flintoff. 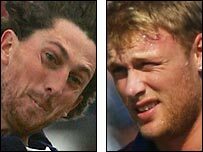 Flintoff, who has just returned to action after a third operation on his left ankle, suffered stiffness in his right knee in Friday's loss in Bristol. The all-rounder will be monitored by team doctors ahead of the third match of the series at Egbaston on Monday. India levelled the best-of-seven series at 1-1 with a nine-run win on Friday. Flintoff, keen to allay fears about his long-term fitness, has made an impressive return to international duty. The Lancashire star returned career-best figures of 5-56 in only his second game back on Friday and has bowled with prolonged hostility. The 29-year-old had missed the Test series against West Indies and India as he battled his way back to fitness after the surgery. Lewis, 32 on Sunday, last played for England against New Zealand in January, although he was named in the World Cup squad but came home early for personal reasons. The Gloucestershire seamer could be asked to stay with the squad if Nottinghamshire left-armer Ryan Sidebottom fails a fitness test on his side injury after Monday's match.